This ^ is me looking at the word count for the second draft I’m currently working on. It’s a second draft of my novel Destroying (sequel to Watching, which is permanently being edited because, well, I’ve improved a lot in the time I’ve been writing it). As second drafts go, I think it’s pretty good, though I say so myself. I mean, it’s probably on a level with the sixth draft of Watching, quality and plot wise, though no one’s read it yet so I might be wrong. I like it when drafts go well. It’s always fun. I’ve been working on it since the 1st June, because I decided to redraft during Camp NaNoWriMo (see my post about why I don’t think this counts as being a NaNo rebel, or if it does, why I don’t have a problem with that). My current wordcount is 79,857 words. I’m aware that that’s quite a lot for three weeks into second drafting, but to be honest, that’s quite slow for me. I mean, I just write fast. I’m a fast writer. I could never go full-time with this whole writing lark because even if I spent 90% of my time on Tumblr, I would still be the sort of person who churns out 5k an hour and finishes entire novels in a fortnight (and nobody likes overachievers). I have written 30 chapters of Destroying so far. If I were editing Watching, about five of those would be new and I would have cut out three of the old ones, but these 30 chapters are very similar to the 30 in the first draft. Okay, the first four are different, and one of these (the most recent one) is from a different POV and has an additional scene that wasn’t in the last draft, because I realised that having a new narrator for just one chapter was a stupid thing to do and I should stick to five POVs. So I highlighted the first 30 chapters of the first draft and discovered that the total came to 73,761. Somewhere along the line I have unexpectedly gained six thousand words. Still, I’m not one to complain about extra words, and I’m pretty sure they’re good ones (though my beta readers will probably shoot that idea out of the sky when I sent them the file in a couple of weeks’ time – provided they want it, of course). I’m feeling proud of myself. 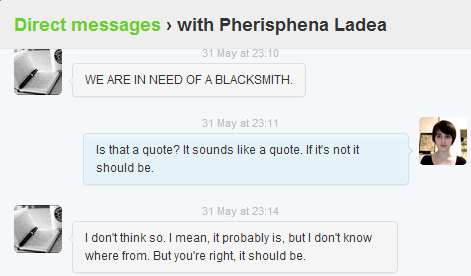 I managed to add in a scene containing the words, “We are in need of a blacksmith,” which originated from a Twitter conversation – I felt it needed to be a quote. You’ll probably be surprised to hear that it was quite a sad, emotional scene, in which the reader rages against the injustices of the world and the characters do too, and in which we see certain characters change and develop from their earlier personalities. I’ve got just three chapters left to write until I can count Destroying as finished, by which time Cathryn has promised she will have sent back her latest comments / line edits on a few chapters of Watching. She says she wants me to make changes. Although I am cringing at the idea – two and a half YEARS of my short life have been eaten by that book, I swear – it will no doubt fill the gap left by no longer needing to edit Destroying every evening. Then I can go on to Returning, the third one (of which I also have a first draft that needs major changes due to the rewrites of Watching that left two extra characters alive). That one needs quite a lot of rewriting, I’m afraid to say. After all, how else am I meant to include those extra special tortures I’ve devised for the Dagda to inflict on his opponents improve the somewhat incoherent structure of a draft that I wrote both on a boat in Norfolk and staying with a family I’d never met before in France? I always write more than 50k so that’s never been a problem for me =) My longest NaNo novel was 126k (and I wrote another one, a 60k one, the same month). But that was mental and neither of the drafts were any good. Reading it through, it felt rushed. But I doubt I’ll ever rewrite it. It would need a lot of work to even be salvageable because it’s just that bad, so I probably won’t bother. Yes, Yes… I should get to scanning eh? And finish editing those last few pages. Probably int he revers of the order I jsut stated. lol. So my next question would be – Do you want me to critique the second half of Watching or should I start on Destroying? Hmmm. Well, I think I need to rewrite the second half to accommodate the changes in the first, so perhaps you would be able to read Destroying for me. At this stage, I wouldn’t ask you to line-edit it, just read it and give me feedback (as I haven’t had any yet). That shouldn’t be hard then. I can do what I did for my first review of Watching. Read it on my Kindle and take notes. Yay :) I sent you a RTF and a MOBI file, but I’ll probably send you a ‘clean copy’ over the next couple of days as I’m just catching a few typos when reading it through on my own kindle. That shouild give me time to finish my critique of Watching anyway.